Isaac just started primary school last year. So this past Christmas 2014 was the first Christmas that took place when he had some idea of what money means. We asked him to save his balance pocket money every day last year, so he did have some money in his piggy bank. One day, in mid-December last year, we went to a neighbourhood mall for dinner. And there, he saw a Frozen themed water bottle bag - which he knew Shawna would like, and toy guns, which he knew Asher would simply love. And he quickly whispered to hubbs and I that he would like to use his savings to buy presents for his brother and his sister. He went home that night and excitedly counted his money. Then the very next morning, he asked hubbs to bring him to the same place and he bought his presents, with his very own money. Hubbs and I were very pleased that he suggested buying gifts for his brother and sister, using his own money, no less. It takes something, to be able to give out of one's own pocket. And I must say he did choose appropriate gifts for his siblings. Appropriate, as in, these would certainly be things the twins would like. Hubbs and I, as a rule, don't buy guns and swords for the kids. It's a different thing if they make it from cardboard etc, but we prefer not to buy arms as toys. However, this time round, hubbs was so pleased with Isaac's spirit of giving, that he allowed him to make that purchase. Isaac and his first Christmas gifts for Asher & Shawna. Turns out I was right. The rifle spoilt after 2 days - it couldn't be cocked and fired any more. Isaac was bewildered, and asked me how come the toy would spoil so quickly. I quickly jumped on the chance to educate him about Price & Quality. How these two factors are very closely co-related, though you can find some rare gems where price is low, but quality is high. Subsequently, the boys were playing with the rifle, and the tip of the rifle scratched Asher and he had a slight abrasion. Isaac promptly declared the rifle unsafe, and threw it down the rubbish chute. Now, barely more than a month after Christmas, the guns and bullets have all disappeared. The pistol is still somewhere (dunno where), but the bullets have all vanished. I asked Isaac what he thought about it. Whether it was a good way to spend his money. He frowned, shook his head, and agreed with me that it was a waste of money to buy that for Asher - as the inferior quality resulted in it being unsafe, and it didn't even last a week. Okay, good, lesson learnt. I hope. 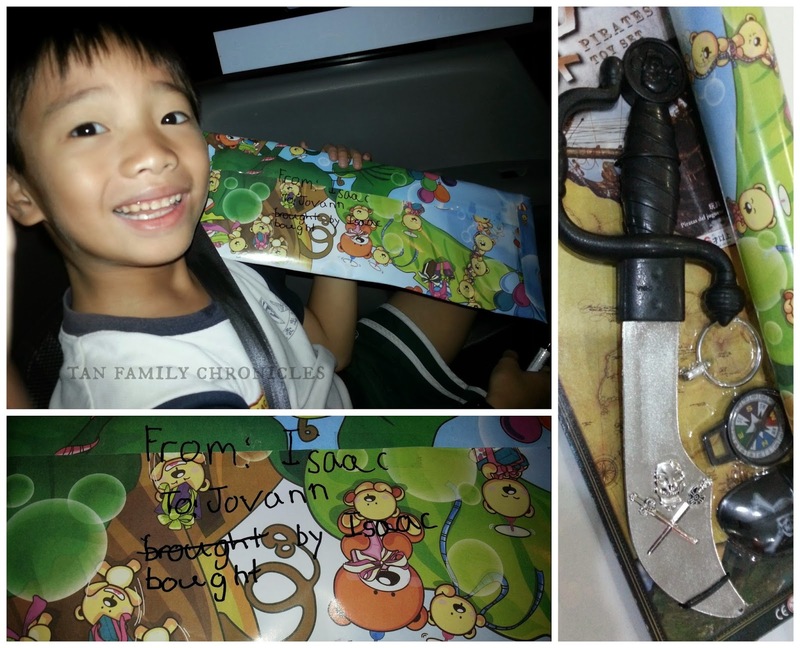 Isaac's present for his classmate Jovann, bought with his own savings. What about Shawna's water bottle bag? It was a perfect gift, I thought. Mainly because I was on the lookout for these water bottle bags anyway, and wanted to get one for each kid. The kids have been going through water bottles throughout the year as though it was a free commodity. They either misplaced them, or broke them through careless and/or rough handling. It was very frustrating, and a huge waste of money. So frustrating that there is another blog post coming up on this, I assure you. In any case, I thought these water bottle bags could be the answer - we will just use a regular pet plastic bottle for the kids, and replace them regularly since they are cheap easy to come by. So I was glad Isaac chose to buy that for his sister. After he gave her the present - which she appropriately squealed with delight over - he was often on the look out for it. He would often ask her why she was not using the Frozen water bottle bag he got her. And when she brought it out and was using it, he would be hawk eyed and often kept holding on to it, or kept making sure that she didn't leave it behind. We were extremely pleased to see that he was finally learning to treasure his belongings - even though, yes, technically it belonged to Shawna. One time, when she didn't use it again, he asked her in exasperation "Do you like the Frozen water bottle bag that kor kor gave you, or not?! How come you don't use it?!" Thankfully, Shawna sensed his displeasure and quickly assured him with calm soothing words that she DID like it, and thanked him again for buying it for her. On hindsight, given the lessons he learnt from the whole episode of buying of the presents... I think it is money well spent! Plastic container perfect for allowance allocation! 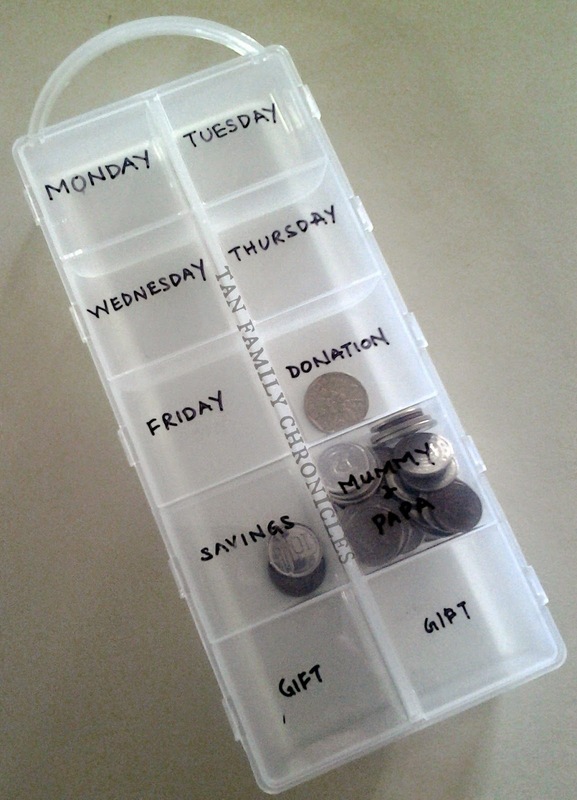 I read this post more than a year ago, and I found the idea of using a 7 day pillbox to allocate pocket money and store weekly savings really useful. It wasn't easy to find a pillbox of that size though. In December, I made a trip to Daiso and managed to find this container above. I thought it was perfect for the purpose that I intended it for. Hubbs and I often forget to hive Isaac his pocket money you see. So this way, we only need to remember to fill it up every Sunday, and it would then be Isaac's responsibility to make sure he takes his pocket money for the day to school every day. I asked him what he would like to name the balance five compartments and we brainstormed about it together. Donations can be donations to church, or to any worthy cause he wants to donate to. He agreed to Savings and Mummy & Papa. I actually suggested "Filial Piety"- he can choose if he wants to give the money to his grandparents or to his parents, I felt that this was to teach him since young that he should set aside money to care for his parents. I hope we won't need it, but I think it is a good value to teach. He didn't want me to write Filial Piety, and suggested I wrote "Mummy & Papa". He rejected my suggestion of a "Spending" box, in favour of having two compartments with the word "Gift". I didn't ask, but I suspect it could be a box each for the twins. However, my happiness was a bit short lived, when I told Isaac that his classmate Jovann was going to celebrate his birthday on Monday. "Do you want to draw him a card?" I suggested. "No, I want to buy him a present!" It was quite obvious where that money would be coming from - the Mummy & Papa compartment. But then, I was also pleased that he would be willing to buy a present for his friend out of his own pocket. "Is he a good friend?" I asked. "Yes, I like him!" he replied. I decided to bring him to Daiso to buy his gift. I figured there was enough variety there for him to buy something for his friend. He smiled all the on our way to the store. "I'm so happy, Mummy! I'm going to buy a present for my friend!" Such good cheer! It was contagious. It makes me happy that he is a generous boy. Of course, I would have to teach him to be discerning when giving. But I'd save that lesson for another day. For now, I'm just very happy that he is not a selfish boy. For more excellent tips on money management for primary school going kids, read this post at Life Is In the Small Things, and A Juggling Mom. Isaac is such a sensible (and sensitive!) boy! Really impressed by his giving heart. 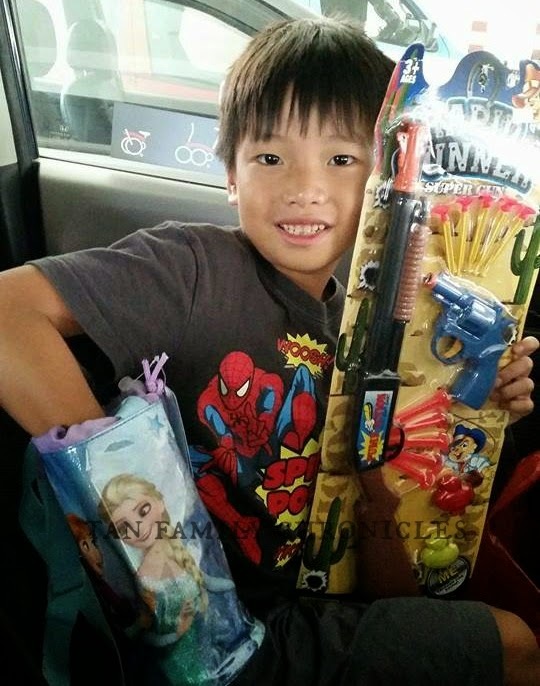 What a generous spirit Isaac has to buy gifts for his siblings and friends from his savings. And I'm sure he learn his lesson that a cheap deal may not always be a good deal. Thanks for linking up too.